In the past week, the rebel force has marched into a string of towns in eastern Congo, culminating in the capture of Goma, the capital of North Kivu Province, and raised serious questions about the future of this vast and often troubled country. In most of the battles, demoralized government troops abandoned their positions and literally ran for the hills. But on Thursday, the army tried a comeback, pounding the rebel-held town of Sake with mortar fire and battling the rebels with machine guns. 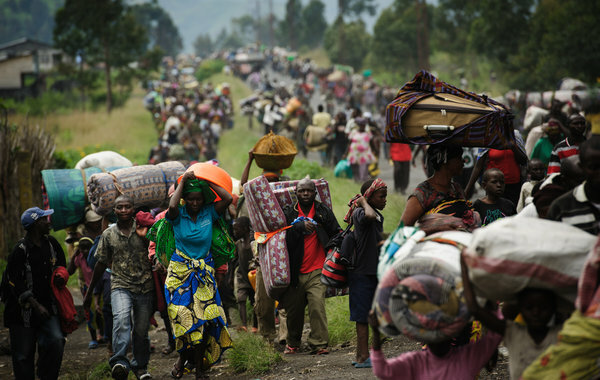 Tens of thousands of civilians fled. “The integrity of this country is not a negotiable matter,” Congo’s prime minister, Augustin Matata Ponyo, said in a telephone interview on Thursday night. According to witnesses, government troops, aided by local militiamen, ambushed the rebels by firing down on them from the hills ringing Sake, about 15 miles west of Goma. By nightfall, it was unclear which side had the upper hand, with some army officers saying they had recaptured the town. But motorcycle taxi drivers in the area said the outcome was still unclear. People streamed out of Sake all day, carrying their worldly possessions on their heads — mattresses, blankets, charred and dented cooking pots and bulging sacks of corn. They joined the hundreds of thousands of people already displaced by the recent conflict. They are left to camp out with little to protect them from the rain or the mosquitoes that can carry malaria. He said cholera and other fatal waterborne diseases could spread if the fighting and refugee crisis continued. One of the militias that has allied itself with the government to attack Sake has been accused of massacring hundreds of villagers in recent months. Likewise, the rebel force, called the M23, has a long history of killing civilians. Though there have been rumors about negotiations between the government and rebels, both sides are still talking tough. If the army succeeds in recapturing Sake, many residents in Goma fear the government may try to forcibly take back the city, which could mean that its 500,000 to 1 million residents — population figures here are vague — would be stuck between opposing military forces.